﻿ Great Trail Golf Course - Ohio. Find It Here. 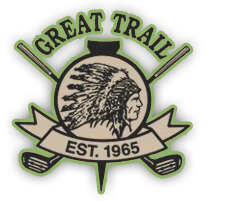 Enjoy 27 scenic holes of golf at Great Trail. Prices include Green Fees and Cart Rental. The 27 holes may be split over 2 days. Tee times must be scheduled in advance. In addition to the 27 holes of golf, The Great Trail Tee House has the facilities to serve banquets, receptions, special parties and golf stags in its banquet rooms, Trail End Room and pavilion.They also offer overnight room lodging for all out of town guests.